With the quality and cost savings provided by forged gears, designers should consider the process, no matter the volume or application of the part being produced. The challenges facing today’s designers grow with each passing year. The global market provides for a more competitive stage, creating more pressure to develop increasingly superior products. Energy issues, as well as government regulations due to environmental concerns, mandate that the designer develop products that are both energy efficient and environmentally responsible. In many cases this requires the designer to reduce the weight of a product while maintaining, or sometimes increasing, the strength capabilities. The good news is that with each new year of challenges comes an equal amount of available resources and technologies to meet the demands placed upon designers. Of equal importance is the fact that the pressures created by the global market, as well as increased regulations, have driven innovation and continuous improvement throughout the entire supply chain that are available to the designer for product development. 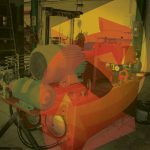 Although these include the Internet, simulation, etc., the forging industry is another good example of this innovation and improvement, particularly in the area of gears. 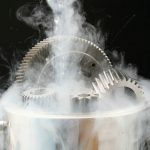 Forged gears and gear blanks have been around since before the sixties, yet I’ve come to find that a surprising number of engineers and designers do not completely understand the advantages that forging has over other forming processes and manufacturing methods. In many cases, they are even unaware of what the differences are between forgings and other formed products, such as castings. The key difference between forgings and castings is that forgings are heated up to a maximum of 2450 degrees Fahrenheit (depending on the grade) for hot forging and shaped to achieve the desired part dimensions. With the casting process, the raw material is completely melted and molten steel is poured into a cast to achieve part dimensions. The disadvantage with this process for castings is that voids and gas pockets are created during the melting and pouring of the steel, and these areas can cause failure points as well as problems with machining. Before going much further into the advantages that forgings possess, a brief description of the basics of the forging process is probably worth reviewing. A simplistic version of the process of forging includes cutting steel to an appropriate size or weight, turning and polishing the billet when surface finish is critical, as is the case with gears, heating the billet to the desired temperature (generally the range is 1900-2450 degrees Fahrenheit, depending on the grade, although with warm forging and cold forging, billets are heated to much lower temperatures or not at all to achieve tighter tolerances), locating the billet on the die in the press or hammer, forming the bar to the desired finished size through a series of preform impressions, trimming and/or punching the flash from the part (unless the part was produced flashless), conveying the hot forgings into a box–or in the case of gears, racking the gear while cooling to avoid nicks and dings–shot blasting the part to clean it, and cold coining to straighten or increase precisionä or again, in the case of gears, to improve tooth profile accuracy as well as finish before shipment. 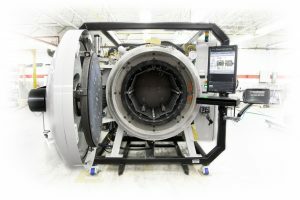 It is also common for operations such as heat treat, machining, and other secondary operations to be involved in part production, depending on the customer’s requirements. Near-net and net-forged gears provide numerous advantages as compared to gears cut from bar stock and forged gear blanks. 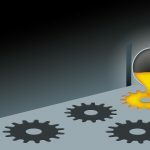 The material savings from the near-net and net-forged process as compared to cut gears from blanks can be as much as 30 percent, depending on the size of the gear. 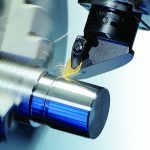 Additionally, with near-net forged gears there is minimal grinding or finish hobbing that needs to be done (usually .045 in. stock or less), which requires much shorter machining cycle times when compared to hobbing from a blank. With net-forged gears the teeth are used as-forged, and only the bore and back face require machining. 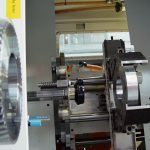 Although these advantages represent the huge cost savings opportunity of near-net and net-forged gears over cut blanks and other metalworking processes quite well, by far the most important factor of near-net and net-forged gears is their superior strength. Because hot working of the material through forging refines the grain flow to be oriented to the shape of the part, superior strength, ductility, and resistance to impact and fatigue is achieved. Additionally, with a forged product there are no metallurgical defects such as the voids and gas pockets that are often found in alternative metalworking processes. The true advantage with forgings is a superior strength to weight ratio that enables the designer to produce a part that is lighter and stronger than could be achieved using other metalforming processes. 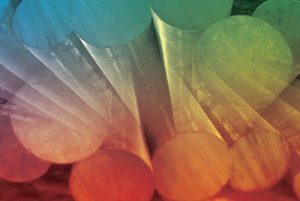 As designers push the limits of load, stresses, and temperature with their products, forgings time and time again meet the calling. As you can see from Figure 1, a cut gear cuts through the vertical grain of the blank, which makes the material much more susceptible to fatigue and stress points. A near-net and net-forged gear, on the other hand, has a grain flow that is uninterrupted all around the tooth profile, greatly enhancing the beam strength and durability of that gear. This provides the opportunity to use a much smaller gear, which obviously has less weight, and still maintain or even increase the strength characteristics. Several experiments have been conducted on the strength comparisons between cut gears and forged tooth gears for both spur and bevel gears, and the results are as follows: The Forging Industry Association states that near-net and net-shaped forged straight bevel gears have six to 10 times better impact and fatigue resistance than cut gears. 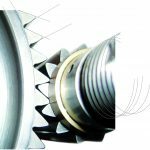 Studies published in the Journal of Mechanical Engineering Science in 1997 state that an as-forged spur gear has a bending fatigue strength 12.5 percent higher than cut teeth in a through-hardened condition, and 8.4 percent higher than cut teeth in an induction-hardened condition. 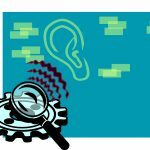 All the cost savings and strength in the world don’t mean anything if the quality capabilities can’t meet the customer’s needs and requirements. As stated previously, net-forged gears have been available to the marketplace since the 1960s. However, at this time the quality of the net-forged gears that could be produced was only able to achieve an AGMA 5-6 rating for a bevel gear. 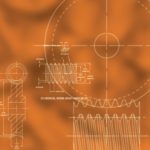 Although this was acceptable at the time for almost all industries where gears could be utilized, excluding aerospace, the quality requirements for products today differ greatly from the expectations of that day. Today’s requirements call for a product that is not only more durable and reliable, but also of superior quality, and in the case of gears this means low vibration and noise. In order to meet these increased requirements, the quality level necessary for bevel gears, for example, would be an AGMA level 8-9 for a bevel gear. Until the last 10 years, this level of quality for a forged bevel gear has not been consistently possible. 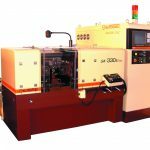 However, with the advances in machining capability in the last 10-20 years, the precision and repeatability that is critical for the tooling that is used for the forging of net-forged gears has improved dramatically. Improvements in tooling for net-forged gears, as well as other process improvements, opened the door to the real possibilities of forging a much higher quality gear, potentially to the AGMA 8-9 level required. This caused several forging companies to begin the R&D process of how to go about consistently attaining this level of a precision gear “as-forged.” From this research, several additional process steps were determined to be absolutely critical to achieving this quality level in a net-forged gear. In order to achieve the precision needed in tooth spacing and tooth shape, the forger must not only have precision tooling, but also must closely track the die wear on the die using SPC measuring tools, and continually check gears during the production process to ensure that quality levels are maintained. Additionally, in order to make the forging process an economical one, special tool steels and tool coatings must be used to minimize die wear and extend die life while still maintaining part quality. In order to meet the run-out requirement, it is also critical that interlocking dies be used. 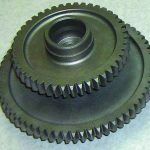 Since the finish of the gear will be “as-forged,” and noise is a critical requirement in many gear applications, the net-forged gear must be forged in an inert environment with turned and polished raw material to achieve the finish requirements necessary for an AGMA 8-9 gear. Additionally, it is also necessary to incorporate a cold coining operation to improve the gear teeth accuracy and consistency. In addition to improving the consistency of the gear tooth spacing and profile, cold coining also helps to improve the finish of the gear, which will reduce noise from the gear. 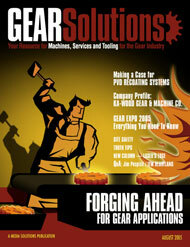 Near-net and net-forged gears can be utilized in many different applications and industries. Historically, near-net and net forged bevel gears were used heavily as differential gears for a large range of vehicles in the automotive industry, as well as in off-road equipment. Today, forged bevel gears are not only used in automotive vehicles, but they are also seen in transmissions and engines for motorcycles, ATVs, and boats. The advantages of the weight to strength ratio that near-net and net-forged gears provide make them ideal choices for these industries and applications. Additionally, forged gears are used almost exclusively in high-performance industries where mechanical power transmission design is pushed to the limits. At Cornell Forge Company, we supply net-forged bevel gears for use as drives for combines as well as many other agricultural, marine, construction, and off-highway applications. We also supply an AGMA class 7-8 net-forged bevel gear for heavy duty deck mowers where gears and gear reliability are critical to the reputation of a product and its manufacturer. Some applications for spur gears include off-highway transmission applications, as well as transmission and engine applications for heavy duty trucks. Traditionally, the perception of using near-net or net forgings for gear applications has been that it only makes economic sense for high-volume applications, such as automotive, due to the high tooling cost and high part cost associated with a high quality class 8-9 net-forged gear. 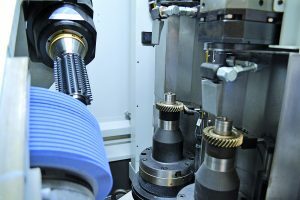 Although it continues to be true that near-net and net-forged gears make the most sense in automotive applications since the volumes associated with this industry make it easy to justify, the cost savings and product quality associated with near-net and net-forged gears can justify their use in most industries and applications. 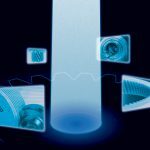 In fact, I would argue that, with the savings available from a gear design standpoint as well as the gear machining process, forged gears make good economic sense even with lower volume applications. 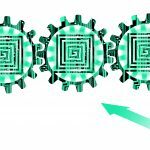 In order to understand how to justify forged gears for their applications, designers need to know what the variables and differences are between forging near-net versus net gears. In many cases, near-net gears can be provided much more economically (piece price) than can a net-forged gear. A near-net forged gear has a small stock allowance left on the gear teeth that can be finished with either a grinding, shaving, or finish hobbing process. Since the gear teeth will be machined by the customer, the forger can adjust the process by taking out expensive process steps, thereby providing a much less costly forged gear. The net forged gear, on the other hand, has the teeth precision forged and they are used “as is” in their application, with machining done to the bore and back face. 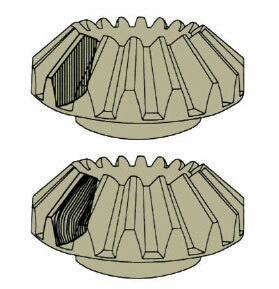 The final decision made by the designer concerning whether to use a near-net or net-forged gear will be dependent on the quality level needed and the forging’s ability to meet that, the cost of machining the teeth versus the additional cost for a more precise forged gear, and the volume of the application and the timeframe to absorb tooling cost since tooling is more expensive for net-forged gears. Although there are few companies that are able to provide a net forged bevel gear to an AGMA class rating of 7 and 8–or even 9 in some cases–these companies, such as Cornell Forge, do exist and can provide a superior product from a cost and quality standpoint. I would encourage the designer to include the forging provider in the design process to gain an understanding of the advantages that the forged gear can provide. Additionally, in many cases, the forger can assist the designer with determining whether there is justification to use a near-net and net-forged gear. 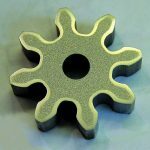 The bottom line is that forged gears offer plenty of advantages and cost savings opportunities and should be considered by all designers–no matter the volume or application of their product. is vice president and general manager of Cornell Forge. He can be reached at kmathas@cornellforge.com or (708) 458-1582. The company's Web site is [www.cornellforge.com].